For nearly 50 years, Park West has built trusted relationships with collectors and artists alike. 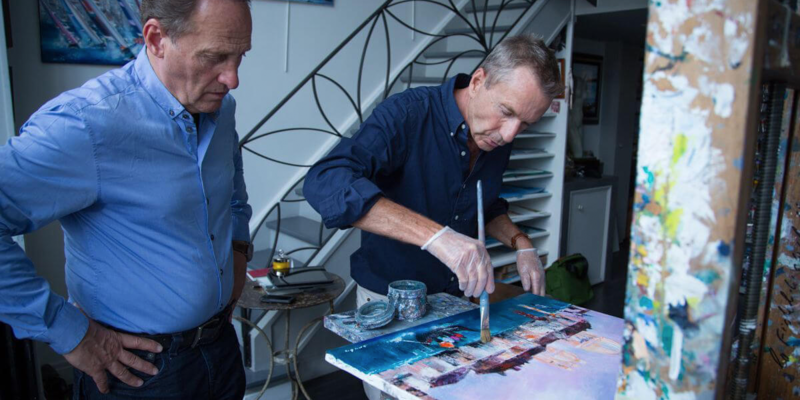 Park West Founder and CEO Albert Scaglione watches artist Victor Spahn as he works on a new painting in his Paris studio. In the art world, trust is the most valuable commodity. Building a trusted reputation is no easy task, but that is what Park West Gallery has done over its nearly 50-year history, developing long-term, trusted relationships and earning the trust of dozens of world-renowned artists and over 1.8 million clients. At Park West, reputation is part of everything that they do. Maintaining this trusted reputation takes a tremendous amount of time and effort. Park West helps artists gain visibility for their artwork, works with certified art experts to ensure the authenticity of classic artwork, educates auctioneers and gallery staff on the wide variety of artists and artworks that the gallery presents and makes customers feel comfortable and informed about the artwork that they are shown. Comfort and trust are built with customers one interaction at a time. This personalized approach makes collectors feel part of a collaborative process with the staff, matching their tastes to the right artwork. After ten years of buying at Park West’s art auctions, Lori and Lee Kalin have nearly run out of wall space in their home, but still they keep coming back. They feel they’re part of the Park West family and that the gallery staff truly cares about them. For instance, attending an exhibition of Israeli sculptor and experimental artist Yaacov Agam was high on Lori’s lifelong bucket list. But she never seemed to be in the right place at the right time. Then Park West invited the couple on a VIP art cruise. Lo and behold, the surprise guest artist on board that journey was Agam himself. Lori not only got to attend an exhibition but also got to spend one-on-one time with Agam. “The Park West staff know us from every time we go, and they know the type of thing we’re looking for and the things we’ve already bought,” Lori says. “That makes a big difference in making us feel confident in what we buy.” And it’s that confidence that has lead to so many positive reviews. 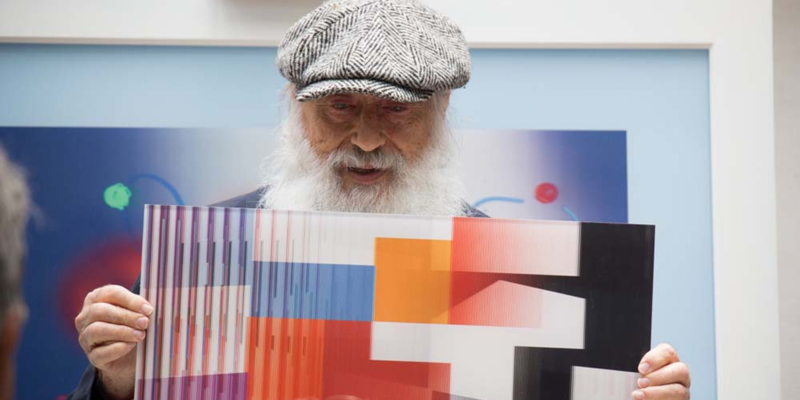 Famed artist Yaacov Agam discussed his artwork at a Park West event. Creating that confidence in clients is a job that Park West’s staff takes seriously, according to long-time Park West auctioneer Jason Betteridge. All Park West staff go through rigorous training before they ever step foot on a ship. Through an extensive and rigorous course, trainees learn about art history and current Park West artists as well as how to run auctions. Once assigned to a cruise, the staff then familiarizes themselves with the artists and long-time clients that will join them on board. For some people, this may sound like a lot of information to absorb. But time and time again, Betteridge says the staff enjoy the continual learning, especially as it helps them forge valuable relationships with artists and clients. 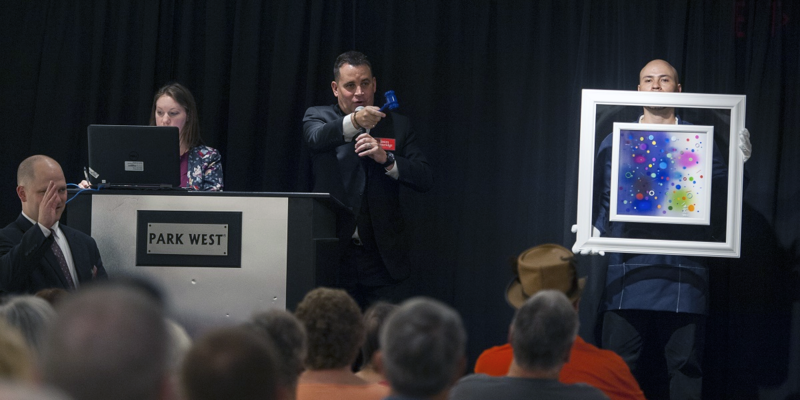 Long-time Park West auctioneer Jason Betteridge leads an auction on board a cruise ship. It’s not just the clients like the Kalin’s who appreciate the one-on-one experiences with artists; the artists value those opportunities as well. 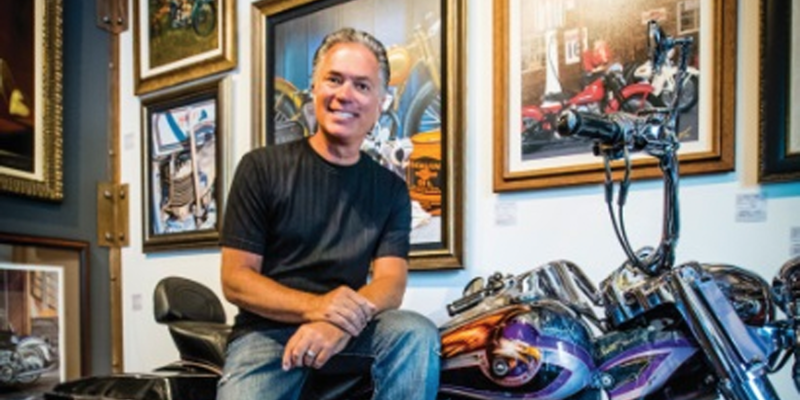 About 15 years ago, Park West first approached Jacob, whose love of cars and Harley Davidson motorcycles is reflected in his art. So he did his research for 18 months, asking other artists about Park West’s reputation and if they were happy working with the gallery. Everyone that he talked to only had positive things to say, and he decided to go ahead with Park West. 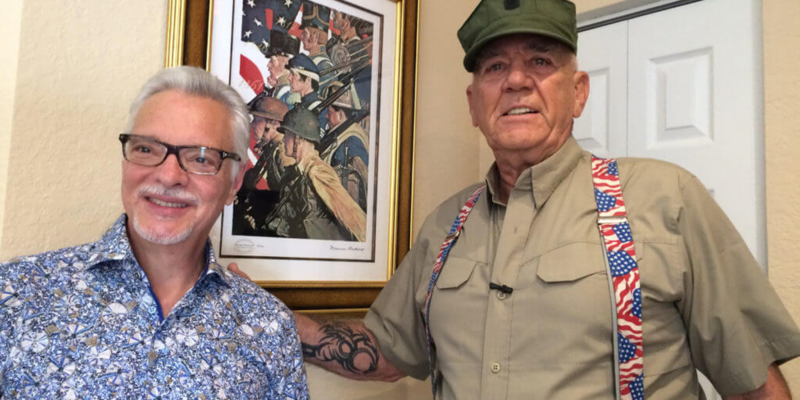 Since then, he has never once regretted his decision and has been impressed with how the gallery has presented his work in, helping him gain exposure. In fact, he says it’s his relationship with Park West that has allowed him to flourish as an artist and enable him to keep doing what he loves. On the collector’s side, because Park West works directly with the artists, any questions or concerns about the authenticity are eliminated. Clients can rest assured that when they buy from Park West that they are always getting the real deal. American painter Scott Jacobs began working with Park West Gallery 15 years ago and has never regretted his decision. Caroline Ashleigh, who has worked with Park West for nearly 20 years, rely on Park West’s sales for their appraisals and valuations. In addition to authenticity, collectors sometimes have concerns about the value of art. To a casual art collector, art appraisals can sometimes appear to be opaque and intimidating, but Park West works to make that process transparent and approachable by looking at many factors — including an artwork’s age, rarity, condition, authenticity, and lineage of ownership — before assigning an appropriate replacement value of a piece. Since its founding, Park West’s mission has been to provide experiences that help their clients fall in love with art. A large amount of effort goes into maintaining Park West’s stellar reputation, but that work is worth it, according to Shapiro. It helps clients feel confident in their collecting journey with Park West.